Tamed Mobs Mod allows you to switch the status of a tamed mob by right-clicking it (passive, aggressive, assist). You’re also permitted to have a tamed zombie, a tamed creeper and a tamed spider thanks to the mod. 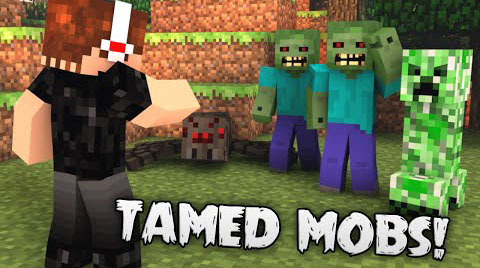 These tamed mobs will protect you, follow you, and attack other mobs for you! Have you ever wanted a pet or friendly creeper, zombie, or spider? Now with this amazing Minecraft mod you can have tamed pet creepers, zombies, and spiders and can raise a mob army to protect and fight other mobs with you with special attack abilities! If its current status is passive, the tamed mob doesn’t attack anyone ? it will only follow you. If its current status is assist, the tamed mob only targets mobs the player has attacked AND if a mob in a specific radius is targeting the player, it will be also attacked. If its current status is aggressive, the tamed mob will attack every mob (no friendly creatures).